About ten months ago my family moved from the San Francisco bay area to the Oklahoma City area. We only knew one or two people, but a job opened up so we moved across the country. Having lived in California for most of my life, I didn't know much about Oklahoma. Before we moved we did our homework and learned as much as we could about the history and culture here. However, nothing could prepare us for what is like to live in a college football metro area where 90% of the people are diehard fans of either Oklahoma University or Oklahoma State University. You choose either the Sooners or the Cowboys, but never both. I can't confirm this, but I think this college love might be part of a native Oklahoman's DNA. The SF bay area is a pro sports region so this love for college football was pretty much foreign to us. Fast forward ten months and my kids have been influenced by their friends and classmates into rooting for Oklahoma, especially when it comes to football. I don't mind as long as they keep their love for the Raiders, A's, and Warriors as well. This new found obsession is why I made them an OU lunch, in the OU school colors, to take to school. Here is how you can make your own, or adapt this to whatever football team your kids root for. 1. Cut two slices of bread into a football helmet shape. I used a cookie cutter to make it easy. Do the same with provolone cheese, but cut off face mask. Place turkey in middle of two helmet shaped pieces of bread and put cheese on top. 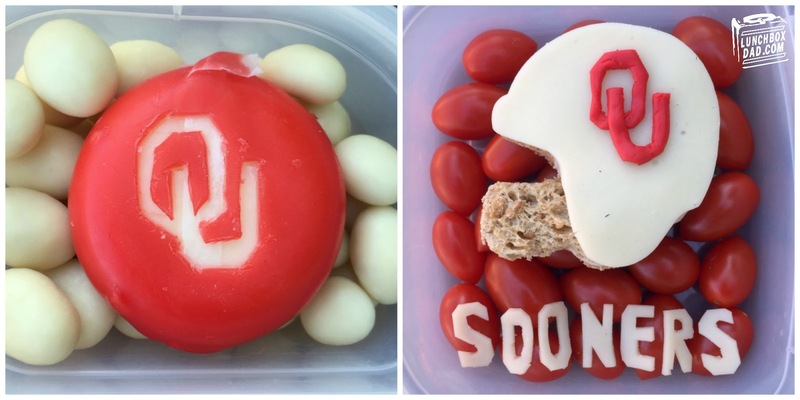 Cut the letters for "Sooners" out of cheese. 2. Place sandwich in main compartment and surround with grape tomatoes. You can also substitute in a different red fruit or vegetable. 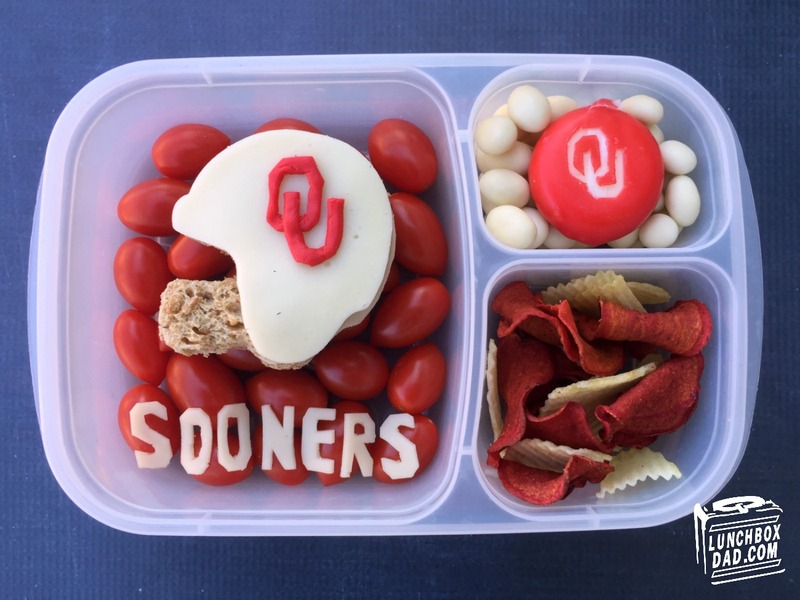 Place the cheese letters for "Sooners" where shown. I used an Easy Lunch Boxes container for this lunch. 3. Form the OU logo from the red edible modeling dough. Instead of modeling dough, you can also just use the wax from the Babybel cheese that you will cut in the next step. Place OU logo on top of cheese helmet. 4. In side compartment drop in yogurt covered raisins. 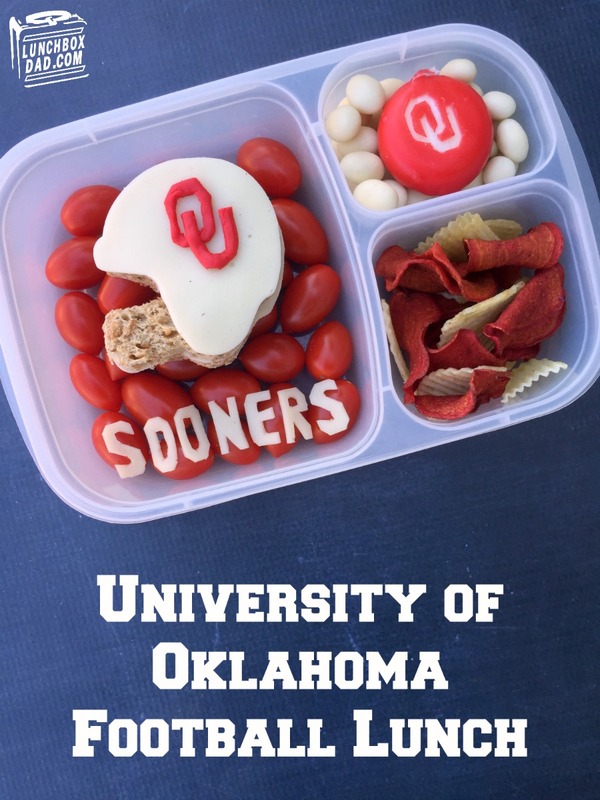 Cut the OU logo from Babybel cheese round. Place cheese round on top of yogurt covered raisins. 5. In second side compartment place potato chips. I used organic root chips that come in a multitude of colors. They would work for many different football teams.